Villa Thousand Hills is a cluster of about four pavilions – all exemplifying boxy, innovative architecture and contemporary tropical luxury. Glassy interiors are appointed with mostly complementary, luxurious furnishings as well as finely finished wooden fixtures along with chic timber wood pieces. Amenities are distinctively five star – to enhance ease and fun for each and every guest. Erected on a hillside ascending from Ao Sane Beach, Villa Thousand Hills creates for you fine vacation living with an appeal that’s definitely classy. The villa has nine air-conditioned bedrooms – two master suites and two guest rooms are on the third floor of the central pavilion, two other suites are on the third floor of the family pavilion, and one suite is on each floor of the two-storey honeymoon pavilion. Eight bedrooms have king-sized beds, as well as dedicated bathrooms with rain showers while the last one is having sofa bed. However, the master bathrooms also have fitted bathtubs. 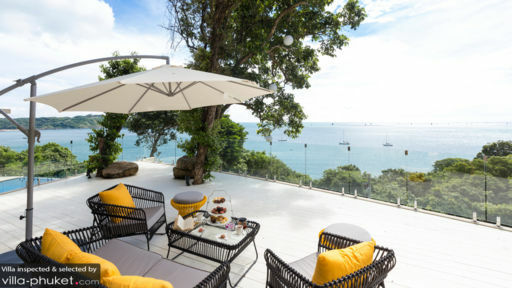 Seven bedrooms open out to balconies with fabulous views of the Andaman Sea. One bedroom has direct access to the saltwater swimming pool. Throughout the property are three swimming pools – a terraced, cascading, fountain pool, an infinity pool with a jacuzzi adjacent to it, and a saltwater pool. Immerse yourself in their inviting, crystal clear waters for some aimless wading, or for some playful splashing. For a tan, you can lounge on ergonomic pool beds on poolside stone decks. But when the temperature rises, withdraw to the shade of the spacious covered terrace between the villa’s three-storey central and family pavilions where you can sit back on its cushioned, angled couches. On the sunny and spacious second floor of the villa’s central pavilion is the living area with its large and luxurious couches oriented towards a wall-mounted, widescreen TV. Here, you can all assemble for amusing and animated sharing and storytelling. Or, await the next episode of the newest hit series. Opposite is the dining area. On its long, brightly finished, timber wood table that accommodates 14, you can all get a taste of authentic local cuisine – as well as international favorites – dished out by the resident chef from the fully-equipped, modern kitchen perpendicular to the dinner table. 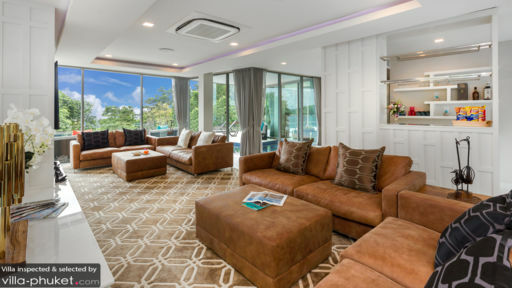 On the second floor of the villa’s three-storey family pavilion is a game room and bar where you can all play for bragging rights on the billiards table as you all toast to every winning shot with premium wine chosen from the villa’s cellar on the ground floor. In the villa’s wellness pavilion is a gym – where you can do your routine workout, and a sauna – where you can sweat it out even more. On the second floor of the villa’s honeymoon pavilion is a cinema room where you can replay your best-loved classic film. On duty to deliver the villa’s everyday services is a staff headed by a manager backed by an assistant manager, a chef, as well as by housekeepers, maintenance and security personnel. Upon your request, a babysitter may be called in. Her services will be charged separately however. Villa Thousand Hills is in close proximity to Ao Sane Beach. Just seven minutes by car from the villa is Nai Harn Beach where you can spend the day swimming and snorkeling. On a separate day trip, go see Windmill Viewpoint, the Big Buddha and Promthep Cape.